Easy to use and gets a perfect cut for corners. Good on DIY projects also. I occasionally use clear packing tape at work for various tasks. I only had a regular roll that I'd cut with a pair of scissors, and fold over the end to make it easier to find the next time. Okay if you're occasionally taping up one box to ship. But then a last minute signage project came along that I needed to cut a lot of pieces of tape to assemble and it was a battle. 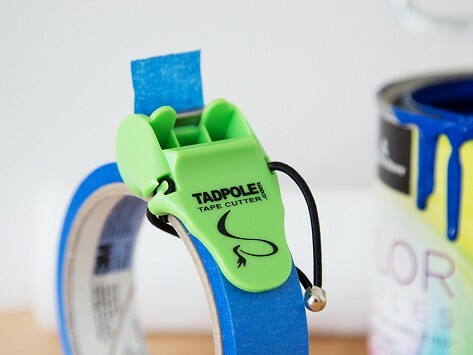 Just after that project I found the Tadpole Tape Cutter through The Grommet email newsletter, so I ordered it. This is the perfect solution! Wish I'd had it sooner. These are fantastic. I basically want them for every roll of tape floating around the house. We keep one on some blue painter’s tape in the toolbox, one on some packing tape, and another on a roll of masking tape that I use everyday. It's perfect for what I need. It's easy to use, it's small enough to easily store when not in use. Handy product ! 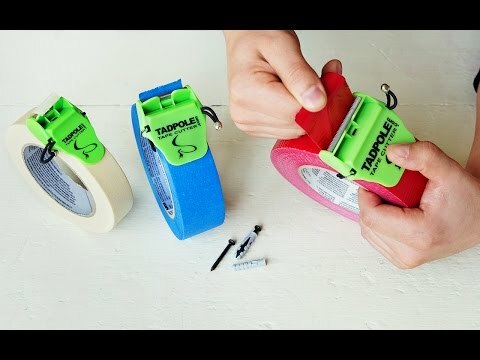 Keeps tape in its place with no hastle. I don't have to turn the end of the tape under, thus saving $$$. I teach Pre-K and use a LOT of duct tape! (Don't ask) This is a life-saver, or at least, a time-saver. I love this cutter. It is so much easier to use than the old one I had. Saves a lot of time during Christmas package wrapping!